The Professional Conservatory (Two and 1/2 Year Conservatory) is accredited by the National Association of Schools of Theater (NAST) and approved by the Bureau of Private Postsecondary Education of California (BPPE). For more information on NAST, Click here. For more information on the BPPE, Click here. The Professional Conservatory (Two and 1/2 Year Conservatory) is the apex of all training programs at the Art of Acting Studio. 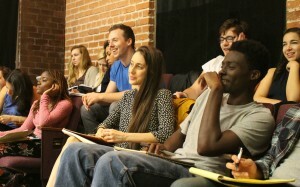 In this exclusive program students learn tools and techniques to better engage their imagination, to analyze text deeply and accurately, to create rich, specific characters, to engage the body and voice fully and to work professionally and creatively on both stage and screen. The goal of this program is to fully prepare students for both the craft and business of acting. Classes are five days a week, and for the September Start, classes are between 7PM and 11PM. As such, the training is intense and intended to produce a comprehensive conservatory experience over the length of two years. Class size is limited to 16 students. By audition only. For information about the current curriculum, please download the school catalog here. productions. The First Year concludes with a Rehearsal Project. continued voice and speech work and an exploration of physical acting. Students begin performance through a short film project called the Genesis Project. Students will develop and create self-generated works, including a performance of an original piece, and will explore more in-depth On-Camera scene work. The semester concludes with a performance of a classical play. The Final semester is devoted to preparing for the professional and performance. Students will have classes about the industry, auditioning, and master classes with industry professionals. They will continue advanced contemporary scene study and On-camera, and will culminate their learning with a performance of a contemporary play. Finally, students will develop a performance Reel which will be shown to industry professionals in a showcase. The application deadline for September 2019 is March 18, 2019. Price: $5750 per semester, Five semesters in total. Admission to the conservatory program is by interview and audition. Applicants must be 18 years of age or older, and must submit the following: 1. A completed application form. 2. Headshot and Resume 3. Two letters of recommendation, including the referee’s address and telephone number. The letters should be from teacher or persons who can supply a recommendation as to the applicant’s character and potential. Referees may be contacted directly. 4. A $65 non-refundable application fee (payable to the Art of Acting Studio).